They’re coming for your microtransactions. I’ve played every Call of Duty for the last decade, dropping countless hours into the multiplayer modes of Activision’s first-person shooters, always ranking my accounts up to the maximum Prestige level. But Infinite Warfare’s microtransactions make me think I’m going to break that streak. Activision’s yearly first-person shooter franchise always has a single-player campaign, but it’s the multiplayer modes in which players sink hundreds and thousands of hours. The series has had microtransactions since 2012's Black Ops II, allowing players to purchase funky weapon camos for their guns, or unlock more weapon loadouts. But these were all cosmetic upgrades—that is, nothing provided players with an extra advantage. That’s not the case in the latest game Infinite Warfare, though. It seems like the entire game is designed to push players towards spending more money just to level the playing field. If you’re a seasoned Call of Duty pro who just purchased Infinite Warfare today, you’re going to find yourself at a massive disadvantage when you hop into a match, because most players who bought the game months ago will have much better guns than you’ll start with. You don’t have to spend real money to buy better weaponry—but you might feel like it after getting wrecked in multiplayer for a few hours. Previous installments of the series have a selection of different weapons that are unlocked as you level up. The difference with Infinite Warfare is that the basic weapon types have RPG-style rarity variants: common, rare, legendary, epic. The epic variants can have super-high damage or fire rate. You want these. My favorite gun in Infinite Warfare is the NV4 assault rifle. The common version might seem pretty solid, but if you take it into multiplayer you’re likely to get outgunned by a player with a better variant. The “epic” rarity has infinite range. Infinite range! How, you’ll think, can I get one of those? Two ways, neither of which is particularly appealing. You can open Supply Drops, similar to Overwatch’s Loot Boxes or Halo 5's REQ Packs, and hope for random weapons. Or you can collect Salvage, which allows you to craft specific weapon variants. You can do these things without spending any money at all, but the reliance on luck and the sheer grind of the game can leave you feeling hopeless about making any progress. Let’s take Supply Drops. You can earn “keys” while playing the game that let you buy them without spending real money. But you only get a few keys, or maybe just one, per 7-to-12-minute multiplayer match. Common Supply Drops cost 10 keys each, and Rare Supply Drops, which guarantee at least one rare item, cost 30 keys. But that’s a rare item, not necessarily a rare weapon. It could be a rare cosmetic customization that does nothing for your chances of winning a battle. Infinite Warfare is larded up with hundreds and hundreds of cosmetic items, and Activision keeps adding more. In January alone, the 1.07 game update added 600 different cosmetic items, versus 100 new weapon variants. The odds are terrible. If you just want to flat-out buy Supply Drops, you can buy COD Points at prices ranging from 200 points for $1.99 to 13,000 points for $99.99. A single Rare Supply Drop costs 200 points. I have personally watched as Twitch streamers and friends spend $20 to $40 on drops and walk away with a ton of unwanted camos and gun reticles. I’m a pretty frugal gamer on a budget, so I’ve refused to purchase any COD Points to try to get lucky with Supply Drops. But I haven’t received a single epic assault rifle from the Drops I have earned through gameplay. My other option is the crafting system, earning Salvage by playing the game, and then using it to make my own Epic weapons. Unfortunately, the number of hours you have to grind to get a good gun are best described as insane. That Epic NV4 assault rifle I so coveted? First you have to purchase all of the lower-rarity variants of the same weapon. That’s 200 Salvage for the common gun, 500 for rare, and 2000 for legendary. That means you need to spend 2900 Salvage to even have the chance to buy the Epic version for 4000. Assuming an average rate of 10 Salvage per match with a 10-minute match length, that’s 100 hours of gameplay required to get a single Epic gun. While it was 2014's Call of Duty: Advanced Warfare that introduced us to Supply Drops and weapon variants, Infinite Warfare is the most microtransaction-influenced Call of Duty yet. In my view from the trenches, it seems like Activision’s focus isn’t on fun gameplay, but coming up with more ways to bleed money from players. Features that we simply took for granted in Call of Duty games, player-friendly features like leaderboards, combat records, and emblem editors, didn’t even launch with the game, and in some cases only became available this month. That’s an eternity for a game series that’s on an annual release cycle. For four months, I couldn’t properly check my multiplayer stats or see where I ranked against other players. But COD Points? Available within days of launch. Infinite Warfare still has three more DLC packs and countless more smaller updates in the hopper, which means that this flood of content is just going to keep flowing. If Activision and developer Infinity Ward want to make the odds of Supply Drops better, they can implement a “retirement” system similar to Advanced Warfare, in which old items are rotated out to make room for new ones. This won’t level the playing field on its own, but it can help increase the odds so players don’t feel like they just threw $20 in the trash after opening Supply Drops filled with silly reticles or unwanted camos. I’ve played much less Infinite Warfare than any title in the series since 2007’s Modern Warfare. That’s how off-putting and frustrating this game’s Supply Drops are. 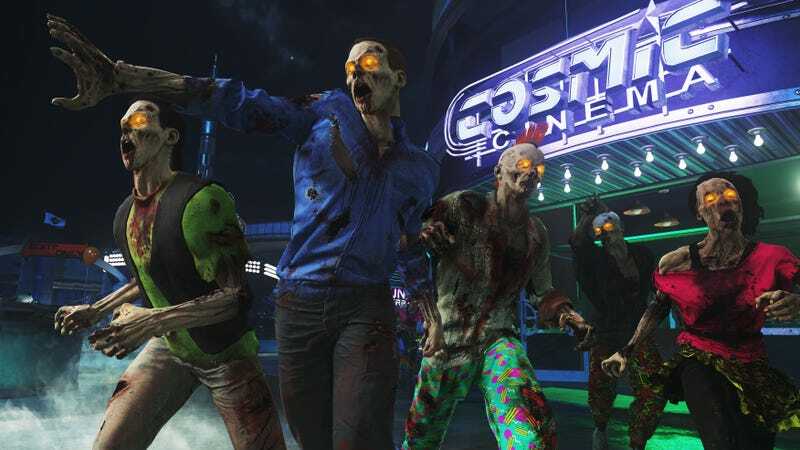 Activision was disappointed by sales of Infinite Warfare, and if it wants to keep the core players it still has, it can’t treat them like Vegas treats gamblers.